"Etude - A musical composition, usually instrumental, intended mainly for the practice of some point of technique..."
This piece by Giuliani is a powerful exercise for right hand arpeggio technique. Giuliani had made a name for himself as a virtuoso of guitar by the time he was nineteen. He was also adept at the flute and violin and by the time he died had added the title of "highly talented composer" to the list of achievements. Get your own copy of the Allegro P.D.F. Just look below; Indeed, he left a legacy of over 300 works for guitar and instrumental combinations, which catered for the beginner to the most advanced guitarist. This piece for classical guitar will help you obtain independence of the right hand fingers and develop great speed and accuracy if practiced slowly to begin with then gradually increasing in speed. 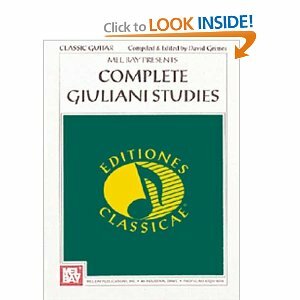 I highly recommend you buy and practice Giuliani's Right Hand Arpeggio Studies As he said..."If you can play my arpeggios then you can play all the music I ever wrote." The left hand in this piece is very stable and makes good use of pivot fingers. For instance, you'll notice in the first line of the PDF music (see below) that your 2nd finger of the left hand stays on the "A" note on the 3rd string the whole time. This allows the hand to stay steady and play the chords of A minor and D minor in a clear, clean manner. It also provides the balance for the bass to be played using increasing dynamics as a melody riff. View the video below to see what I mean. Even when the left hand has to come off the strings to change chords it is done with the least amount of movement. My old teacher used to call it... "economy of movement." He was right! Even the right hand arpeggio in this piece is played with a very relaxed hand and very little movement. This allows for good speed and a full, unstressed sound. Look at my right hand in the video for instance. You can see the fingers of the right hand brushing softly up against one another. You can tell from this position that my hand is very relaxed. I hope Guitar Lesson 2 has been of interest and help to you!